When I was a child, ghosts were very real to me. I knew they shouldn't be. I knew what my mother told me. She told me that ghosts were not real, but every time I traveled to the family house in Cheboygan, Michigan, I felt that they were real because I felt them in the house. It is because of this house and because of my grandmother, who lived in the house, that my fascination with ghosts and haunted places grew into what it is today. 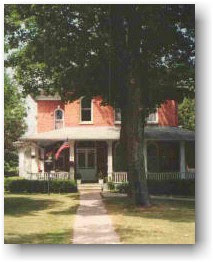 The most haunted place I have ever visited is my family home, the Newton-Allaire house in Cheboygan, Michigan. This house has been in my family for almost 150 years. As long as I have been alive, it has been the residence of my grandmother and my great-aunt. Several years ago they both departed the home leaving it empty. The house itself is a beautiful 8 bedroom Victorian within walking distance of the down town. My grandmother spent much of her life painstakingly restoring the house so that it is as historically accurate as possible. When she was alive, she spoke of the house as a person and loved it as if it were her child. This seems appropriate to me, because the house has always seemed alive and the house has always been alive with ghost stories. My father once told me that there was a spot in the house that turned ice cold at midnight. At night, the house is filled with odd noises and bizarre lights. One of the last times I stayed there, I was awoken int he middle night to find my night table shaking and what sounded like a train passed through my room. My mom says she awoke one morning to find a ghost holding her hand. The same trip that I awoke to the loud noises, I had travelled to a wedding as well. My wedding clothes were carefully nestled at the bottom of my suite case. I never used them during my stay at the house and I never touched them, however after I left, my family found them laid out in an unused room. They were laid out like someone was going to wear them. When I was little several sets of family photos came back from the house filled with white blobs. My parents, reluctant to believe in ghosts, tossed the photos and blamed it on bad photography, but I always knew the house was filled with the ghosts of our family. The house was alive with them and I think that is why I never wanted to leave. I still miss it and I often hope the ghosts aren't too lonely. I am leaving on Sunday to journey back to the old house. The last time we visited, it had been empty so long that the ghosts seemed to have gone with the people. It was quiet and all haunting activity was gone. I'm hoping this time, I'll catch a glimpse of the house as it was when I was a girl. I'm taking my little bag of ghost hunting tools and I'll be staying in the room with the most haunting activity. Whether or not I find ghosts, I know I'll find my family there and that it will be a wonderful trip that I've been looking forward to for a very long time. Hi Jessica. Have a wonderful trip. Wave to us on your way past SE Michigan. When you said that the house had been empty a long time and the haunting activity seemed to have gone ... it reminds me of what my medium friend used to say ... that hauntings feed off the energy of the living. And when a place is low energy, there is not much to manifest and vice versa ... which is why construction often kicks things up. And why places with a lot of emotional charge ... like theaters, airports, ER's ... can be very high on haunting activity. It sounds like a wonderful house. I too know ghosts are real. When I was a young child, I lived in a house that was very active with lots of paranormal activity. My mom's stories of her encounters is was got me so interested in ghostly things. Interesting article here. Looking forward to reading more real soon. Good luck!! I had thought of renting it, but the rest of the family thinks it is a bad idea, so we are just waiting now. Thanks for the info, I hadn't thought of how much energy ghost take from us. I'll tell you what weirds me out more than the ghosts- it's how so many people see a ghost right in front of them and still don't believe in them. I've known people who have done that, and it always leaves me scratching my head. The non-belief that some people have in the paranormal is every bit as powerful as some people's belief in the paranormal, religion or whatever they're passionate about. That disbelief is so strong that it can cause them to see something right in front of their own eyes and still convince themselves that they are somehow defective and that their experience was somehow a malfunction in themselves. Sorry for the rant, it just gets to me! Enjoy your vivit to your amazing family home here in Michigan! I look forward to hearing more about your adventure. It's really lovely here in the summer enjoy! Jessica, I'd love to talk with you. I found your blog as I was searching for information on this house when I found out it was for sale. My family is actually connected to yours, through the Newton side though. Archibald P Newton was my grandfather's great grandfather. I have often been told stories about him and when he lived on the island. My email is chachel_02@yahoo.com.